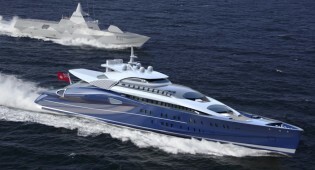 The Blohm + Voss 110m Fast Luxury Motor Yacht – Superyachts News, Luxury Yachts, Charter & Yachts for Sale. The Blohm + Voss 110m fast motor yacht – a superyacht design which has a max speed of over 40 knots with a range of 3,000 nautical miles at 21 knots! The expert team of Blohm + Voss is presently developing a series of predesigned custom yachts allowing clients to profit from the Blohm + Voss experience in large yacht new builds and leading to shorter delivery times as well as reduced building cost. The first project out of this series is: B+V 110 Motor Yacht Fast. Blohm + Voss present a new 110m luxury power yacht, a direct descendant of the famous 74m MY ECO (now ENIGMA) superyacht, designed at that time to be the fastest yacht of its size. This new B+V 110 MY/fast high power fast yacht with its long stretched profile sits in the water waiting to unleash its incredible power and combines the extremes of yacht design; on one hand speed and sportive appearance, on the other hand luxurious owner’s and guest’s quarters with well protected outdoor areas. The unique exterior styling completes an unrivalled yacht concept study. In the engine rooms of the Blohm + Voss 110m Fast Luxury Motor Yacht close to 110,000 horse powers (which is comparable to 100 Bugatti Veyron’s) can speed up B+V 110 MY/fast via water jets up to 40 knots with two extremely powerful MTU engines coupled to two steer able Wärtsilä 9000 water jets and two gas turbines also coupled to two further Wärtsilä 9000 water jet boosters. At the maximum speed of 40 knots B+V 110 MY/fast can roar non-stop between Monaco to Athens within only one single day (25 hours). The internal layout of the B+V 110 MY/fast is based on most efficient usage of space. The bridge has been designed at the very top deck 6. The Owner’s 280 sqm complete private deck 5 consists of a large state room facing the bow which is illuminated with natural sunlight through an amazing skylight, en suites as well as an office with a reception and waiting area well located close to the main staircase. A spacious outdoor area opens from the Owner’s state room, towards the bow providing supreme privacy and protecting him from the elements while sunbathing. The entire Upper Deck 4 offers common and entertaining areas for the Owner and his Guests with a spacious lounge having access to the forward deck where Jacuzzis have been placed on each side of the yacht. A separate dining room can be converted into a conference room and there are also to be found a library as well as a gym with access to the aft outdoor area. Six comfortable Guest cabins accommodating 12 Guests are well located together one deck below on Main deck 3. An easy access is provided for the Owner and Guests boarding the yacht via the side gangway leading to the main lobby next to the lift and the main staircase. On the same deck there are a cinema and a large outdoor area in the aft to enjoy more entertainment. The tender garages with side shell doors on deck 2 can accommodate on one side a small light weight seaplane and on the other side a 7m (23 ft) tender as well as various water toys. Greatest design, she only belong to top 50 of richest man in the world. The owner must love water life and rich experience of crusing. This mega yacht only belong to people who understand yacht and truly love yachts. Not for money just for life. Do you have more interior photos. How much of it? Here is James from China-Heysea Yacht Company Limited.